People walk through the centre of Lesbos, Greece. (c) Owen Humphreys PA Wire/PA Images. All rights reserved.British journalist Daniel Trilling, who won the 2017 Migration Media award, is known for his work on refugees, European borders and migration systems. Trilling’s new book Lights in the Distance: Exile and Refuge at the Borders of Europe is devoted to stories of people searching for asylum and shelter in the European Union. I spoke to him about his new book, media coverage and a changing Europe via email. In 2015, the topic of refugees became one of the key issues for European media and politicians. You, as far as I know, have been writing about refugees long before that. When did you first take up this topic and what was your first material about the stories of asylum seekers? In 2012, I visited Athens to research a piece about the growth of the far-right – which was my main interest at the time. During my visit I went to interview a group of Afghan refugees who had been targeted by neo-Nazi violence and I was really shocked by what I found. 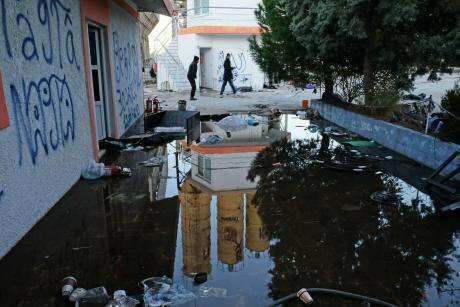 In theory they were free, living in private accommodation in a city neighbourhood, but in reality they were completely trapped: not only by the threat of attack by Golden Dawn, but also by police violence, a dysfunctional Greek asylum process, and an EU border system that tries to control the movement of refugees. I became interested in how this wider system operated, and the effect it had on the lives of the people who encountered it, so I started travelling to different parts of the EU – or to neighbouring countries such as Ukraine and Turkey – to meet refugees and other migrants, then following their journeys. The EU spends a lot of money in order to fence its borders from refugees in the last decade. What the recent so-called “refugee crisis” has changed – what obstacles do asylum seekers face now? After a period of political hesitation in 2015 – roughly speaking, between the two shipwrecks off the coast of Libya in April, which provoked panic among European leaders, and the Paris attacks of November, which shifted the focus of debate from humanitarian to security concerns – the EU has sought to restore the old system, in which as many asylum-seekers as possible are prevented from reaching its borders, and as many as possible of those who do are contained in the southern and eastern European member states. 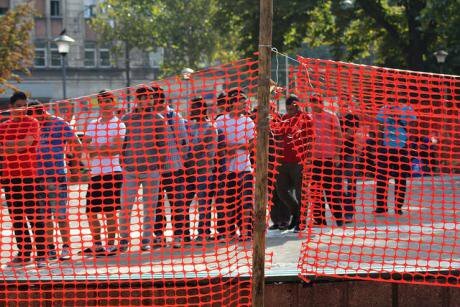 This involves a further militarisation of the old system: since 2012, border fences and surveillance networks have been built or extended in Greece, Bulgaria, Hungary and elsewhere, while security patrols have been extended in the Mediterranean. Inside the EU there has been a growth in the use of remote camps and detention centres (particularly in Greece and Hungary), the introduction of racialised police controls at internal Schengen borders (for instance, on the border between France and Italy) and the criminalisation of European citizens who help asylum-seekers continue their journeys. The EU has also been outsourcing border control to states further afield: a deal with Turkey that lowered the number of Syrians and other refugees crossing the Aegean Sea in early 2016 has been followed by attempts to strike similar deals, or invest in border control, or pressure countries to accept deported failed asylum seekers, in various parts of Asia, Africa and the Middle East. It is pointless to put fences in order to separate from refugees. Photo: CC BY 2.0: Meabh Smith/Flickr. Some rights reserved.This is having three important effects. First, it's undermining the principles of international refugee protection established by the UN convention of 1951, which are that refugees should not be punished for trying to cross a border without permission, that they should not be pushed back to unsafe countries and that people should be treated as individuals. Second, it's creating further violence and instability in countries outside the EU, most of all Libya, where a European effort to discourage sea rescues and to turn back smuggler boats has trapped thousands of migrants in detention centres where they are abused, tortured and in some cases enslaved. A a recent Italian attempt to pay Libyan smuggler gangs to stop sending migrants to sea has also fuelled fighting between rival militias. Third, it has reinforced divisions within Europe: between migrants and parts of the population who fear their arrival; between the state and people who form migrant solidarity networks. I've written about this, and what it tells us about how borders work globally, at greater length here. Migrants and refugees have always been the subject of speculation and the fomenting of fears by the tabloids and yellow press. During the last crisis, it just happened again, or did something new appear in how conservative media react to the refugee issue? You’ll have to forgive me for talking in very general terms, because I can’t follow media coverage in every European country, in every European language – but I think the media coverage of the refugee crisis was, above all, fragmented. You had a single crisis of European border policy, with flashpoints in different places at different times: the central Mediterranean, the Aegean Sea, the Greek Islands, southern Italy, the Balkans, Germany, France etc. Each time a new situation arose you saw the news media rushing towards it, producing material that was very immediate and vivid. If a media outlet wanted to evoke sympathy, then it would convey human need and desperation. If an outlet wanted to evoke hostility, it would convey chaos and anger or violence. Often we saw both at once. But the coverage often failed to join up the dots; to show that refugees were being forced onto one route because of the closure of another. For example, one reason people crossed from Turkey to Greece by sea in 2015, and not across the land border, is that the land border had been sealed in 2012. There was also a longer-term pattern of EU countries shutting off legal and safe routes to asylum, such as claiming asylum at overseas embassies. Without this kind of context, a lot of the media coverage – even well-meaning coverage – gave the impression of a unstoppable and unprecedented tide of refugees, seemingly coming out of nowhere. In my opinion, the way out of this is for journalists not only to provide adequate context, but to think of people on the move as individuals with political agency, who are trying to take control of their own lives. A well-meaning stereotype of the refugee as innocent child – although of course, there are vulnerable children who do need help – can cause damage too. You’re right that migrants and refugees have always been a focus of racist media coverage, and this has certainly been present in the last few years. This involves the familiar tropes of invasion by foreigners, a “clash of civilisations” between Islam and the west, and the allegedly savage or sexually deviant or uncultured behaviour of migrants. What’s new I think is how these have joined up to form a new, specifically European racism, which sits above its various national forms. Benedict Anderson described nations as “imagined communities”; the European Union is another kind of imagined community – both shaping and shaped by realities on the ground. The EU has created this external border that divides it from the rest of the world; and so the people who cross that border without permission are cast by some as a threat to the EU project, and to pan-European identity. How big is the difference in how the media in different countries covered the topic of refugees? Some of the broad themes I described above have been similar across Europe, from what I’ve seen. But what interests me is how they are put to different political ends. 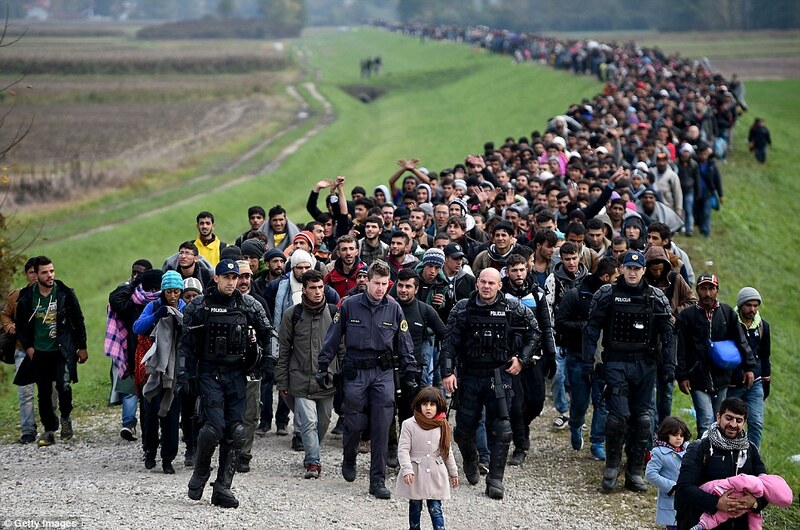 Take, for example, this famous photo of refugees being led through Slovenia by police in October 2015. To a Merkel-supporting outlet in Germany, this might be evidence that Europe needed to act together to help accommodate refugees (or at least, the Syrians among them). To a pro-Orban outlet in Hungary, it might show why “Christian” Europe needed to build fences to defend its civilisation from Muslim outsiders. In Britain, the image was used by the far-right UK Independence Party for a pro-Brexit poster during the 2016 referendum campaign, suggesting that the ultimate problem was not refugees but the EU itself. In the context of the UKIP poster, people noted the similarity of the image to a Nazi propaganda film about Jewish refugees before the Second World War – but that was probably the opposite of what the original photographer intended. Media will use the same basic ingredients for very different ends, which is why it’s important to pay attention to how stories are constructed and what context they are presented in. For further reading, the Ethical Journalism Network published a study of how European and international media covered the 2015 refugee crisis and identified some of the main problems. Your new book will be released in the spring of 2018. What is the main focus of this work? The book is a portrait of the EU's border system, seen through the eyes of asylum-seekers who encountered it. I followed a dozen or so different people, from Africa, Asia and the Middle East, over several years and the book tells their stories in detail. It also has a chapter on Ukraine, briefly comparing the journey some of my family took in 1920 – they left Kiev for Berlin during the civil war, and then Berlin for London in 1939 – with journeys taken by Somali refugees and Ukrainian IDPs today. Do you think that the “refugee crisis”" was used by the Russian ruling class and the media under its control in order to weaken Europe and help strengthen the nationalists and right-wing radicals? Or is this just another conspiracy? Some of the commentary has been pure conspiracy theory. The claim by a Nato chief in 2016 that Putin was “weaponising” the refugee crisis to “break” Europe – a claim echoed elsewhere – I thought was nonsense. This gives Russia a kind of power it doesn’t possess: Russia is relatively weak, which is why it has covertly provoked and participated in a war to destabilise Ukraine, and why it brutally reinforces a shell of a regime in Syria. This analysis also misses the role of European border policy, which forces refugees to take increasingly dangerous and chaotic routes, in creating the refugee crisis. And it misses the role of western powers in other conflicts: Syrians make up about half the asylum-seekers who have come to Europe in recent years but there have also been significant numbers from Iraq and Afghanistan, and many people from different parts of Africa who have come to Europe via the chaos in Libya. 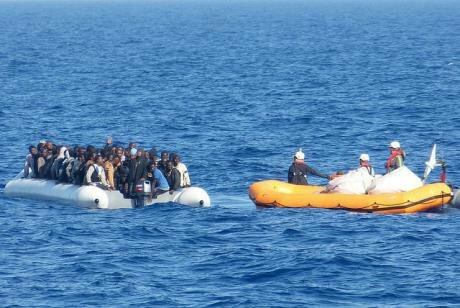 Often refugees have to choose the most dangerous sea routes, because the way overland for them is closed. Photo CC BY-NC 2.0: Brainbitch/Flickr. Some rights reserved.But racism and nationalism begin at home. Russia's ruling class may well see its interests in promoting reactionary nationalist views to stir up hostility towards migrants in Europe. But it cannot create these things out of nothing. The growth of European far-right parties stems from a crisis in political representation, where the mainstream left and right have, to varying degrees, accepted neoliberal ideology – market values are the values by which we run society; the state is not there to build, only to clean up the mess – and have tried to shut out the alternatives. When far-right movements have challenged this by appealing to nationalist or racist sentiment, their flames often fanned by reactionary media coverage, the mainstream parties have tended to try and co-opt this message rather than stand firm against it. Nationalism is the glue that elites use to try and keep deeply unequal and unfair societies stuck together. That's a problem we all have to face and we can't blame it all on Russia. How did Europe change after these events? Do the media keep interest in asylum seekers? Asylum and migration is a constant topic of interest for European media, but it's largely returned to a background hum for now. As for how Europe has changed? Well, it's too early to tell... the number of refugees who arrived in 2015 is relatively small – less than a million, in an EU of 508 million people – but the manner of their arrival was chaotic and there are big questions about how we can provide for one another, live together, make stronger societies. These aren't just questions about refugees and "natives"; they also apply to communities hurt by austerity policies, or by long-term economic inequality and deindustrialisation. Can we build on the networks that form in response to a crisis? Can we convince people who are sceptical, or actively hostile, that we have shared interests? A healthy media would help us discuss these questions.